The photo above shows the different colors and surface finishes of the copper metal coating. The colors and surface finish can be modified by the chemical content of the copper liquid and the amount of polishing done in different areas after it has set up. We generally polish the raised areas the most, leaving lightly polished backgrounds darker. The upper left photo shows high polish (brighter) in the high areas. We normally use this finish for text, borders, and artwork on our copper signs, because it provides better contrast with the background and this readability than the other finishes. We coat our HDU and metal plaques and signs with a copper liquid spray using a spray gun or airbrush) .We use their proprietary blend of composite real metal particles and a binder (similar to epoxy resin for fiberglass) that we cold-spray onto virtually any substrate, including high-density-urethane (HDU), acrylic, aluminum, and steel, to create the look and feel of solid cast brass metal. The metal coating has a living finish and will age naturally over time. The metal is applied as part of a proprietary seven-step process by our craftsmen. At an average 10-mil thickness (metal electroplating is less than 1-mil thick), our copper-coating process adds less than four ounces of weight per square foot, provides the durability of solid cast metal, and is non-corrosive. Our copper-coating and HDU substrate has a Class 1-Class A fire rating. Our proprietary metal-coated HDU substrate may be used for interior and exterior applications. The metal coating will not chip, flake, bubble, or peel and will last a lifetime. Our metal coatings include copper, bronze, brass, nickel-silver, stainless steel, aluminum, and iron. 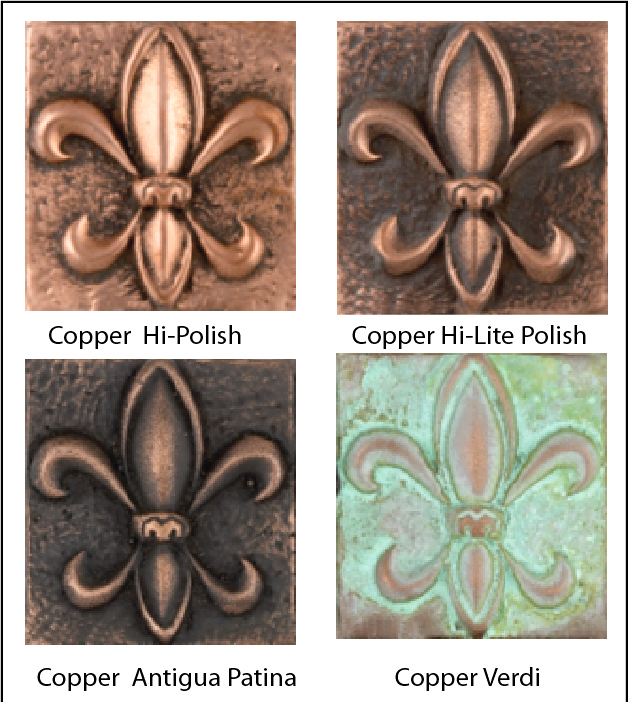 All of these coatings can be applied with a patina, spot-polished, or high-polished, as shown in the above photo. M7210. Samples of other colors and textures are shown in the photos M7003 (bronze), M7101 (brass), and M7251 (nickel-silver , steel and aluminum). Please click on "Return to List" below right to see our photos of our bronze, brass, copper, nickel-silver, gold, silver, stainless steel and aluminum plaques and signs.